UPDATE: The Election Procedures Committee received the Returning Officer’s report at Tuesday’s meeting about the RU-Pass referendum. The committee will issue a decision in writing by Nov. 27. The decision will be posted here. Students protested today against a closed-door meeting investigating Ryerson Students’ Union (RSU) alleged misconduct during the RU-Pass campaign. Students weren’t invited to the meeting of the elections procedures committee, which was to be attended by alumni, faculty, staff and the RSU. While the RSU cannot vote on anything, some of its members were to be there to represent the student body. Details about the time and location of the meeting were not made public. 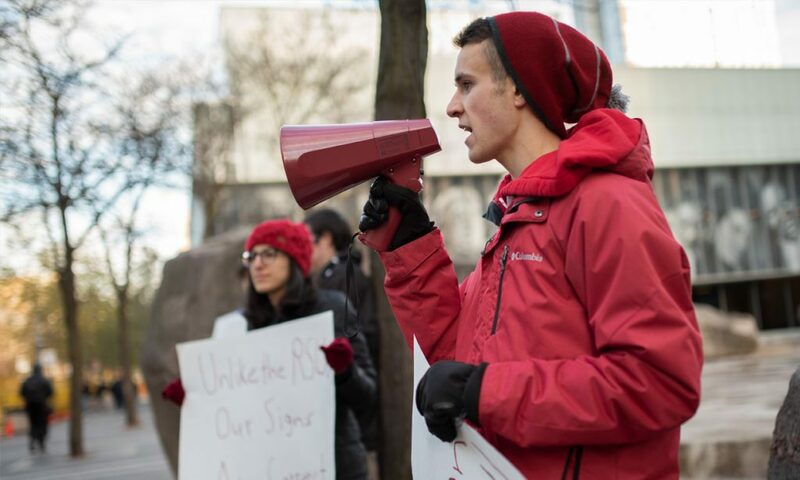 Diana Schwendener, a molecular science PhD student, and Jonathan Bradley, a journalism student, organized the rally that took place Tuesday afternoon at the intersection of Gould and Victoria Streets. The main reason behind the rally, Schwendener said, is the lack of transparency behind the meeting. Schwendener said she has repeatedly asked the school’s administration to release the details of the meeting, including where it will be held and at what time. However, she has not received a response. Students should be allowed in the meeting, she said, to let the school know that an inquiry should be made into the RU-Pass and its controversial campaign. At the very least, she said, those students who were told incorrect information by members of the Yes campaign should be allowed in to voice their concerns. “They seem to want to keep us out of this meeting, or at least that’s the impression I got,” she said. It was their two petitions, circulated after the referendum passed, that brought Schwendener and Bradley together to organize the protest. They collected just over 700 signatures between the two petitions — one called for a revote and the other for an opt-out provision. The misinformation from the campaign, along with an apparent lack of transparency with the election procedures committee, spurred Bradley to action, he said. Last week, the Ryersonian revealed that the RSU had broken several rules and disseminated false information in order to get students to vote in favour of the RU-Pass. Namely, students were told that a GO Transit deal was on the horizon, but that Metrolinx wanted to first see Ryerson work something out with local transit. However, Fannie Sunshine, media spokesperson at Metrolinx, said that no such plans were made between Metrolinx and the RSU. Students were also told they could easily opt out of the RU-Pass if it did not benefit them. However, only people with accessibility needs will be allowed to opt out. The controversial pass will come into effect in September 2019 and will cost students $70 per month, or $564 per school year. Schwendener said she would like Ryerson’s administration to look into the RSU’s conduct during the RU-Pass referendum. She wants the school to take students’ allegations seriously and, she said, and she wants the RSU to consider a re-vote. Schwendener said. “The RSU seems to show a pattern, especially in this referendum, of misinformation. They posted the incorrect voting dates, they misrepresented the opt-out system and I think a lot of students were very frustrated that they were misled into voting for it,” she said. Walton said that she thinks students should have more of a say when it comes to fee increases. 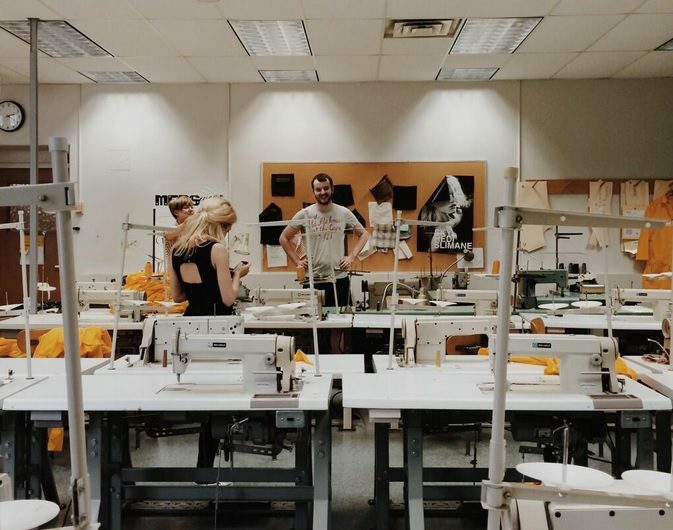 “I’m hoping that Ryerson is actually going to take the students’ thoughts and feelings into account and revoke what they’ve just done to us,” she said. Schwendener wants to see the RSU apologize, and said that if the student union was truly confident in the referendum, it should have no problem doing a re-vote. The way the meeting is set up seems to imply that the RSU is trying to “self-govern,” Schwendener said. In an email, Ryerson president Mohamed Lachemi said the school has no plans to change university referenda policies. “At this time, the board secretariat is reviewing any challenges they may have received from students about the election itself,” he said.